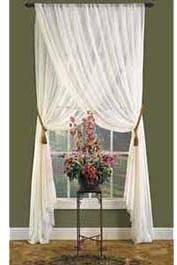 You can create this elegant window design in less than an hour using Hancock Fabrics’ simple instructions and an array of sheer fabrics. This window treatment will surely give you ideas for decorating every room in your home. Overall effect is best using lightweight sheers that do not have a visible right or wrong side. 1. Install decorative rod and brackets above top molding of window. 2. To determine fabric yardage, measure from top of rod to floor. Multiply result by 2, and then add 10” (for small “puddle” of curtain on floor). 3. To prevent ends of curtain from raveling, apply seam sealant to both ends of panel as directed on package and allow sealant to dry. If preferred, sew a narrow hem by folding raw edge 1/4”, fold again, and stitch in place. 4. Drape curtain over rod, centering fabric lengthwise. 5. Install a cup hook on each side of window for tie backs. 6. Pull front layer to right side and secure with tie back. Pull back layer to left side and secure with tie back.